Should I Buy A House That's Part of a Homeowners Association (HOA)? Among the list of properties you're considering, you may find one key difference that comes in the form of three letters: HOA. If you have never been a part of a neighborhood organization before, you may have questions about the benefits and costs associated with purchasing (or building) a home within these areas. To finally get some answers, let’s take a thorough look at how HOAs help maintain beautiful neighborhoods, safe environments, and a sense of pride in a community. 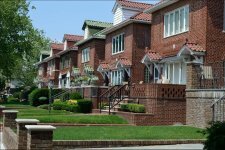 Homeowners associations (HOAs) are legal entities that charge homeowners a monthly fee in exchange for amenities and services, such as general maintenance and plowing. HOAs are commonly found in subdivisions, condominiums, and unit developments. Additionally, an HOA’s board upholds neighborhood aesthetic requirements for all houses in the neighborhood. Mandatory: When people purchase homes that are supported by HOAs, their contracts require that they pay dues. Mandatory HOAs are established to maintain aspects of the neighborhood that directly impact all members of the community, including neighborhood rules, aesthetic standards, and noise regulations. This mandatory governance helps to unite the neighborhood and add to community cohesion. Voluntary: Voluntary HOAs don’t require a signed agreement in order to move into the neighborhood but still offer some advantages for homeowners. New members of a community that choose to pay monthly dues are involved in decisions that directly impact their neighborhood. These associations are often formed by a group of neighbors that focus on improvements, safety, assistance, and social events. HOAs are governed by a board of directors, which the neighborhood elects. Those directors help define the parameters of their given neighborhood by informing the community of agreed-upon standards. It should be noted that some HOAs are regulated more strictly than others. For instance, some may regulate various elements of your property, ranging from the color of your house to the style of your mailbox, while others may be more lenient. It's important to know the structure and regulations of any HOA before deciding whether a particular neighborhood may be right for you. In a recent report by the City Observatory, researchers found that nearly a third of people have never interacted with their neighbors. While this may not initially come across as a significant detail, Professor, Doctor of Psychology, and Contributor for Psychology Today, Art Markman, asserts that the number of personal interactions we have each day directly correlates to our level of happiness. So why not find a way to interact with your neighbors by means of a common purpose? Accordingly, not only can you help uphold the aesthetics of your community, but there’s a good chance you’ll make a few friends along the way. After all, only 20% of people regularly spend time with their neighbors, despite proximity, noted the City Observatory. By being part of an HOA, homeowners have a built-in means of boosting neighborly interactions. Upscale neighborhoods with swanky amenities charge higher homeowners association costs. According to Realtor.com, a typical single-family home normally owes $200 to $300 per month. In high-end areas, such as Hollywood’s Sierra Towers which offers valet parking and 24-hour concierge service, residents are charged about $4,000 a month in HOA fees! Smart home buyers will know to ask critical questions upfront, including how much the monthly fees will be, how often increases are anticipated, what the fees cover, and whether there are additional charges for optional services. However, fees that contribute to a uniformly beautiful neighborhood are reassurance that your property value won’t take a nosedive. The collected fees are usually split two ways: monthly expenses and long-term repairs. Monthly expenses generally include lawn care, community upkeep, and snow removal. Conversely, long-term repairs typically include disaster relief, as well as roof repair, siding repair, road and sidewalk repair, and tree removal. HOA fees cover expenses that benefit the community as a whole, in terms of safety, aesthetics, and cleanliness. What happens if someone fails to pay HOA monthly fees? HOAs sometimes have the right to evict a person from his or her home or foreclose the property if payments are continually missed. However, missing one month won’t leave a family on the streets. HOAs generally send a notice stating any repercussions if payments are continuously missed. The board may restrict an owner’s rights within the community, such as revoking access to the community pool or even placing a lien on the property, until dues are paid. It's important to know this up front because, even though you may not anticipate missing a payment, times of hardship are often unseen and you don't want to be stuck without options. What if an owner can’t afford the HOA fees? Keep in mind that financial institutions take the monthly cost of an HOA into consideration when determining a mortgage payment. But if an incident occurs such as job loss or other unexpected expenses appear, homeowners should talk to their HOA board before they miss a payment. Some boards are willing to be lenient and make arrangements if they’re made aware of the situation ahead of time. If you’re looking for a beautiful location and a piece of mind, moving to an area with an HOA may be for you. Maleno has many houses for sale in HOA neighborhoods. If you’re interested in learning more, contact us today to see how we can help you.